Ten years after the Hispaniola sailed away from Treasure Island with her cargo of gold, Jim Hawkins, now a young man, is landlord of the Admiral Benbow, and leading a comfortable, uneventful life near his old friends Dr Livesey and Squire Trelawney. But then a terrified young woman comes looking for him and begs him to find the father of her young son - the pirate Joseph Tait, whom Jim last saw on Treasure Island. And Jim, despite his vow that nothing would take him back to 'that accursed island', again sets sail on the Hispaniola. Again he finds himself in desperate danger, threatened by the murderous characters, drawn by the lure of silver, who lurk on the island and have made it a kingdom of evil. In this gripping, powerful sequel Francis Byrne reintroduces all our favourite characters. Ben Gunn is still on the island, and Long John Silver leaves the island where he is enjoying his ill-gotten gains to climb the heights of Spy-glass Hill with Jim. Violence, murder, and the quest for treasure make for a cliffhanging adventure threaded through with the story of the mysterious young woman who sails with the Hispaniola. Written in the voice of Jim Hawkins as he would be ten years on. 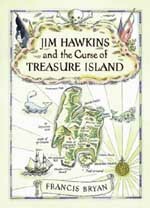 The inside cover carries a map and a sticker on the outside cover of the books invites readers to correctly identify the square on the map where Jim unearths the treasure. The correct location could be derived from the charpter describing where they find the treasure (pp278-81) which was at the south east corner of the Table of Rock at 04°50'40"N 44°50'50"W. The entry from Mrs Parr of Lancashire was drawn shortly after the closing date of 1 August 2002 and she received £5000 worth of antique sovereigns.